Hi, Good Morning. Thank you friends and viewers. 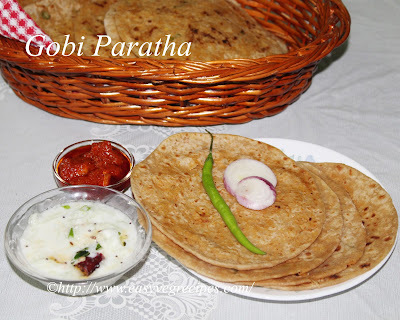 Today I will post how to make gobi paratha recipe. This is a punjabi recipe. I picked it from one of our far relatives, who have punjabi friends. They have the habit of exchanging each others recipes and prepared dishes sometimes. I like this gesture as it will make people acquaint with each other. That is how we can know each other's culture and traditions also. I have learned it in two ways one is mixing the grated cauliflower in wheat flour, adding all the spices and making roti. That is very simple. The other one is saute the grated gobi along with spice powders. Stuff this in the dough and make roti. Both are easy for me of course and both tastes really good. They melt in the mouth. I like to have them in the dinner instead of breakfast. But North Indians take them in the breakfast also. Serve them with a spicy pickle or raita. I like them without any accompaniment also. Any paratha straight from the hot griddle to the serving plate is tempting and satiate. 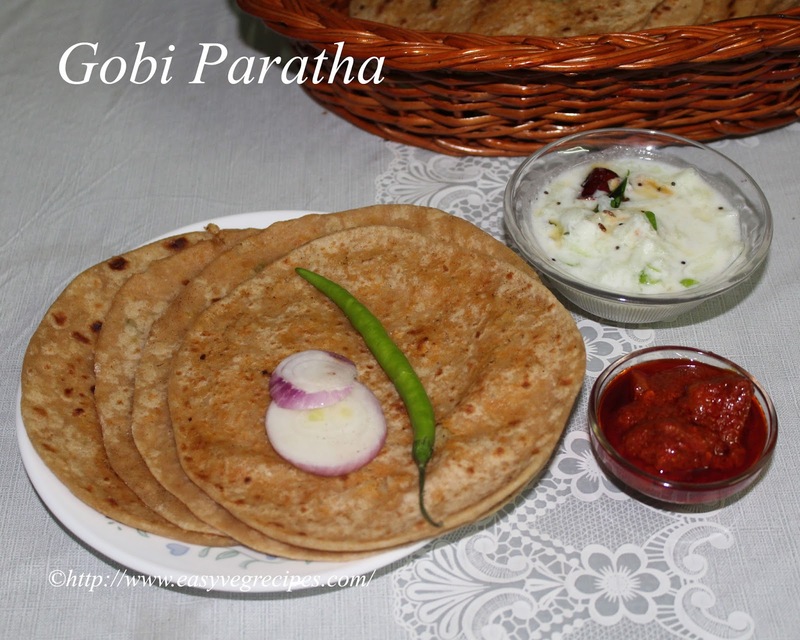 Gobi Paratha -- An Indian flat bread made with the combination of wheat flour and cauliflower. In a mixing bowl add wheat flour with little salt and water. Knead it to make a soft and pliable dough. Add 1/2 a tablespoon of oil and knead it again. Cover it and Allow it to rest for half an hour. Divide the florets and wash them thoroughly. Grate them using grater. Chop green chillies. Heat oil in a kadai, add grated gobi, green chillies and saute for two minutes. Add salt, garam masala and red chilli powder to it. Keep stirring and cook till the moisture evaporates from the vegetable. This may take 10 to 15 minutes. Once done allow it to cool till we can handle with hands. Once the gobi cooled, make equal size dumplings and keep them aside. Make the dough also to equal size balls. Roll one dough ball into 3" disc and stuff with the gobi dumpling. Cover it by folding all the edges into center. Remove the excess part of dough. Gently roll it again into 4 to 5" disc. Heat iron tawa or non-stick tawa, place the rolled paratha on it. Cook till brown spots appear on one side and flip it. Make all the parathas in the same way with the rest of the dough.